The Asian elephant has been the disappearance of his ancestor mammoth, the largest land mammal after the elephant of Africa! 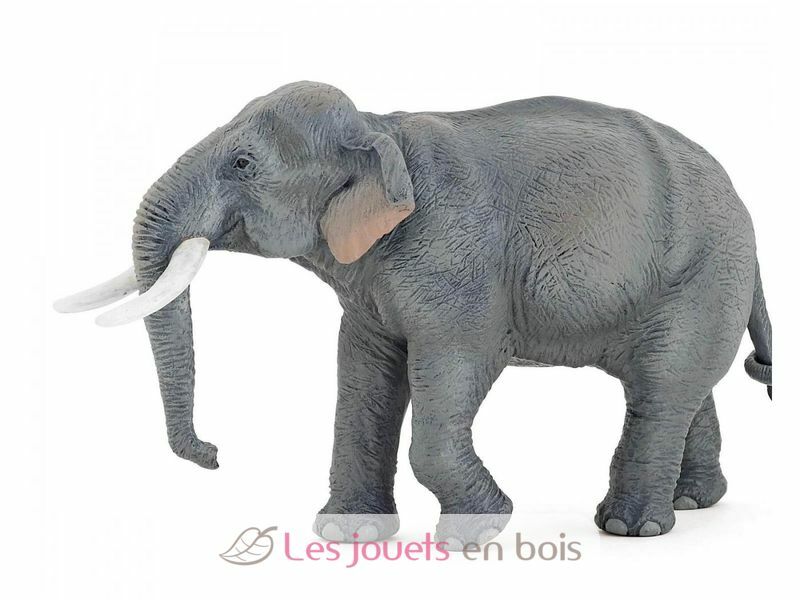 What distinguishes its African cousin is its shorter ears, his smaller size and its trunk has one finger at its end while one in two account with the African elephant. The trunk is actually an extension of their lip and their nose, allowing both to communicate and to bring water and food to the mouth, pull and carry branches, scream. Their tusks are made of ivory and email and are in fact two teeth, used as a tool and as a defense in the fighting. Elephants live in herds of about twenty individuals and gathered around the matriarch, the oldest of the group. They spend most of their time looking for food. They feed primarily on leaves, bush branches or trees, fruits or bark. Symbol of wisdom, they are also known for their intelligence and memory, hence the expression "to have an elephant's memory." Asian Elephant, a pretty figure on the subject of wild animals, carefully painted by hand and modeled very realistically. Papo figurines will soon become the basis of a collection to enrich gradually awakening and discovery for your child.